The Queen Creek Olive Mill is a refreshing stop. You might as well check it out while you are visiting the Schnepf Farm. Just go across the street and you are there. You have probably heard how healthy olive oil is. Healthy yes, but more than that it’s tasty! My first experience with dipping olive oil was in an Italian restaurant in Las Vegas. We were enjoying the fine view when this waiter in a spiffy white coat walks up and delivers the most incredible fresh crusty bread in a basket, and with a flourish poured olive oil into a small dish. Then right in the middle of it poured a small island of Balsamic vinegar. Wow, was that great with bread! Anyhoo, the olive oil at the Queen Creek Olive Mill is a gourmet extravaganza! They have all kinds of samples that you can try out with pieces of bread and lots of crackers. Sample the citris, vanilla bean, and garlic oils and you will be amazed. And there are some spectacular whole stuffed olives you get to taste. One of our favorites is the oregano flavored olives stuffed with feta cheese. Or the mesquite smoked almond stuffed olives. You must do the olive mill tour! Here’s what you get with the tour: a delightful talk about olives and the mill, info about the grove, types of olive oil etc. Then when the talk is over you view the pressing room to look at the mill equipment. What you will learn on the tour are things like how long does olive oil stay fresh, what is extra virgin olive oil, (why you don’t want anything else), what is “lite” olive oil, pesticides and anything about gourmet olive oil. How long can you keep olive oil? Answer, about a year. Even in an unopened bottle the “grassy” overtones will start to disappear. I guess olive oil isn’t like wine; it doesn’t get better with age. What is extra virgin olive oil? Your tour guide will explain that it is the first press. Olives are fresh picked at the peak of flavor. They are pressed by mechanical means with no use of high temperatures or gross sounding chemicals that can get in the way of taste. 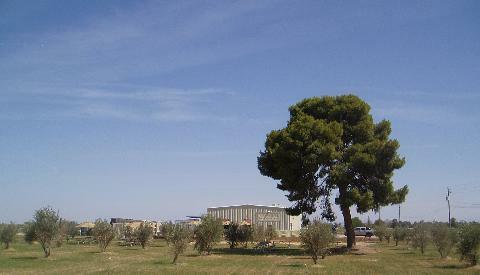 You will see the equipment at the mill where olives are made into extra virgin olive oil. There’s a glass wall next to the store that you can look through if you happen to get there when a tour is not available. Arizona is blessed with lots of sunshine and high temperatures, so do you know why that’s good for olives? Bugs! The olive fly pest doesn’t like the heat. So no bug sprays are needed. One of the most exciting additions to the Queen Creek Olive Mill is their own coffee roaster. It is most fascinating to watch the green beans get loaded into the roaster, hearing the popcorn like snapping of the beans, and then getting a whiff of the fresh beans. You'd think the beans out of the roaster would smell like strong coffee but surprisingly smell more like burnt toast. Pour a cup and try it out. Superstition blend is a favorite! Best of all it is some of the best gourmet coffee you will ever taste. Notice the lack of bitterness on the finish and just plain good aroma to your nose. Premium beans like Arabica are all they use. Superstition coffee is tasty and you'll always want to stop by and get a cup and say hello to these nice folks. The owners of the coffee station are most friendly and will be happy to tell you all about coffee. When you are done with your visit and driving home be sure to appreciate the fine desert views. 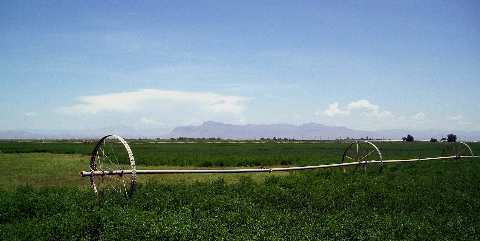 Here’s a picture a beautiful green alfalfa crop just north of the olive farm. Notice the Superstitions in the background. 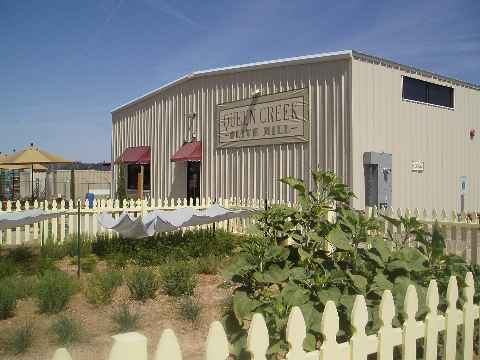 The Queen Creek Olive Mill is located at 25062 S. Meridian Road in Queen Creek. If you are going south past the Schnepf farm it’s on the east side of the road. You are going to turn East on Riggs/Combs Road and you can see it from there. There's lots of parking on both sides of the building. Last time we visited the first parking lot was packed but there is gravel parking lot on both sides of the Mill.